FILE -A model of the Wing Loong II weaponized drone for the China National Aero-Technology Import & Export Corp. is displayed at a military drone conference in Abu Dhabi, United Arab Emirates, Feb. 25, 2018. The use of armed drones in the Middle East, driven largely by sales from China, has grown significantly in the past few years with an increasing number of countries and other parties using them in regional conflicts to lethal effects, a new report said Monday. 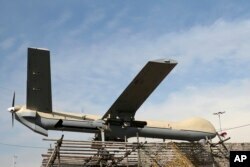 FILE - An Iranian drone Shahed-129 is displayed at a rally in Tehran, Feb. 11, 2016.